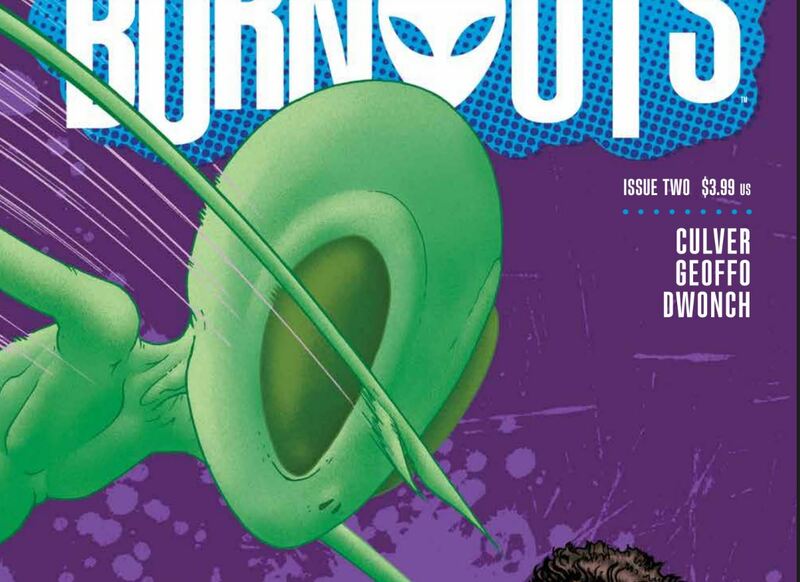 Burnouts #2 Review: Great art and characters that leave you wanting more – AiPT! Is Burnouts a one issue wonder or can its thin plot continue to provide enjoyment? Burnouts from Image Comics has a familiar premise. Andy is a normal kid in high school who longs to go to parties and have a girlfriend. He does not know exactly how to go about this, but the cool kids who do drugs (the titular burnouts) seem to be his way in. Despite its simple setting, Burnouts has used smooth characterization, cartoonish art, and a wacky alien invasion story to make for a fun issue. Is Burnouts a one issue wonder or can its thin plot continue to provide enjoyment? The highlight of the issue is GEOFFO’s art. Once again the look of Burnouts fits its silly story perfectly as GEOFFO gives the comic a Saturday morning cartoon look. Burnouts deals with a silly premise and the art mirrors the story excellently. However, while the art mimics the story’s out of this world premise, it is still detailed. Character expressions can be seen clearly, adding humor and excitement. In particular, there is a panel early on that takes on a frightening Invader Zim like look. Dennis Culver’s characters continue to impress. Burnouts is a high school story that deals with students who do copious amounts of drugs while attempting to fight off a covert alien invasion. The basic description is the plot of a bad B-movie, but what separates Culver’s story is his charming cast of characters. The crew of Burnouts may seem familiar, but they are not tropes. The writing makes the readers feel comfortable but never bored. The reason the characters are so familiar is Culver’s handle on them. Culver injects a life into them that prevents them from being caricatures. These are not characters we have seen in other movies, but people we have met in real life. Andy is a well written character readers will be able to relate to and even empathize with. The same can be said of the burnouts themselves. This adds to the story’s readability. The main problem with Burnouts # 2 is its length — the story is way too short. The entire issue plays out like a minor scene in a bigger tale. The character interactions may be fun, but the entire issue is a hybrid prank/training that ends up going nowhere and ends abruptly. The whole endeavor comes off as unfair to both the characters and the readers. The shortness of the issue does not allow for subtleties to fit into the story. Does an alien invasion comic involving high school kids getting high need much depth? Maybe not, however the fact that the burnouts only see the aliens when they are mentally impaired does lead to interesting story options. Unfortunately, this aspect cannot be visited when entire issues take up one scene. The series is very young and only time will tell what direction it will take. Nonetheless, the brevity of the issue does bring to question how much of a story can there actually be. Dennis Culver’s Burnouts is off to an intriguing start. While there is not much to the story so far, the comic is filled with enduring characters that draw readers into its narrative. That being said, in its present form, Burnouts lacks any substance. However, the ingredients are there for a very fun story.